The third day of snowboarding but actually only the second time I carried my camera. And of course without the camera in order to take the obligatory summit shot I could not climb any peaks. But as yesterday, I had no idea what I was going to climb. The previous evening I had bought a topo map of the area and identified a few potential targets, but in terms of feasibility (remember that I only had my snowboard boots with me, no crampons and no ice axe) I had no idea. Today we had gone to a different ski resort (Kaltenbach) and after doing a bunch of runs in the morning on my own (because I had started an hour late after spending an hour on the computer answering emails) I met the others near the "Wedelhuette" an upper-end mountain resort where we were going to have the first coffee/hot chocolate/beer of the day. It was about 11.30. From the terrace of the hut I could see immediately to our west an impressive looking peak, with an easy to negotiate ridge line. Or so it looked. In the summer it would be have been a nice 15 excursion, but I estimated that now it would not take much longer. There were a lot of snowless patches visible (there had not been any snow in three weeks) and the only place where I felt some concern, was a fairly steep section near the beginning. However, it appeared that someone had gone up there already because I could see what looked like steps leading up that steep section. Still I was ambiguous about the whole idea and it took me until after our little break when the others were putting on their skies again to make up my mind. I voiced my decision and we agreed to meet again later on in a different part of the ski resort. Off I went. After leaving the hut I had to descend a few meters down to a saddle from where I immediately got working on the steep slop. I had been correct in my assumption that someone had been up this way before me. Nice big (and flat) steps had been kicked into the slope and had no problems going up. After that initial section the going became much easier due to the snowless patches and the partly exposed summer hiking trail that I followed up. Only occasionally did I have to cross a snow bank, but this was never a problem either, because either I again followed steps up it or I was\ able to work my way around it. After 15-20 minutes I arrived at the top and was immediately overwhelmed by the nice views. I took of my gloves and hat near the summit cross as I was sweating profusely, more so than if I were snowboarding) and started taking pictures. I learned later that the others going up a chair lift nearby were able to see me at the summit). Unfortunately, I was not able to name any of the peaks surrounding me - and there were quite a few - but so what, I would have to come back in the summer and do a few more. Immediately to the west was another peak with a cross not on its highest point but further down where it was presumably more visible from the valley below). The traverse would have taken 10 minutes in the summer and I seriously considered it for about 5 minutes. But as I tried to do the first 20 meters in that direction I sank in to my knees and realized that there was more snow on that ridge then what I had experienced earlier. I decided to call it a day, also because I still had to go back the way I came from, I had not told anyone about these additional plan and because I was scheduled to hook up again with the others. So I turned around, ate a sandwich at the summit and then had an easy descent down the ridge and back to the lodge where I easily located my snowboard and then went after the others. 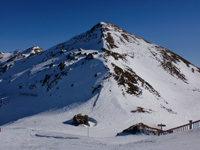 The second peak of the day consisted of another cross-marked summit near the top of a chair lift. It was called Gedrechter and I could see a couple of maintenance roads leading up to near the summit (I turned out there was another chair lift topping out on the other side, but not visible from where I was). I decided not to take those roads to the summit but rather go straight up the ridge in between. So I strapped on the snowboard and rode down the hill where I was across the saddle and as far up the snow bank on Gedrechter's western side as I could. When I ran out of steam, I took of the snowboard and continued on food carrying the board. It only took another 5 minutes or so and the summit was reached. I sat down and again enjoyed the snowy landscape of the summits surrounding me. The Zillertal was clearly visible as was the Zell ski area across the valley, where I had been the previous day. It was already fairly late in the day, and the lifts would stop soon. Because I could ski all the way down into the valley and therefore did not depend on any gondola, I decided to wait at the summit until most people had cleared of the mountain before going down myself. I had the sun in my back and could therefore slowly watch the shadows of the peak I was on and others get bigger and bigger until most of the Zillertal was in complete shadow. While I was sitting there a back country skier came up to near the summit. He never made it all the way to the high point being content where he was. He took of the skins and sat down for to eat a sandwich. I ventured over thinking that he must be a regular in these mountains and may therefore be able to name a few of the many peaks I saw. However, upon me stating my request, he only responded in monosyllables and I never got any clear meaning out of him except something along the lines of "Oh there are many peaks in the Zillertal". Great that much I knew already. I left the misanthrope and went back to the summit, where at 16.20 I strapped on my board as well and after the skier had left also went down the mountain. The summit was at about 2300m and the valley floor at about 500m, and I was therefore able to snowboard down more or less 1800m, which was pretty cool. I arrived at the bus stop at 5pm, just in time for the bus that took me back to the hotel in Aschau where I met the others. Great day.